Thought this was an interesting snapshot of 15 metro areas in Michigan. It looks great for us but it's really depressing seeing how many down-and-out Michigan metro areas there are. It's harder for smaller metros to shift out of stagnation in general right now across the country. The 3 largest metro areas in Michigan are either gaining residents at a healthy rate, or gaining momentum toward a healthy rate. I think that's pretty good news for the state. I think Michigan will continue to see a consolidation from the minor metros and rural areas into the larger cities for the foreseeable future. Below are the updated municipal numbers for the communities that more or less make up the urban areas of select cities in the metro area for those who are interested. The bulk of Ottawa Counties growth remains in Grand Rapids western suburbs which are growing at nearly double the rate of the rest of the region. I believe this will further strengthen the commuter numbers between the two counties for the 2023 metro realignment. It's unlikely that we will see Holland/Grand Haven classified as an independent metro again. The urbanized area of Grand Rapids has accounted for almost 2/3rds of the population growth for Michigan as a whole. I do think growth momentum has started to slow a bit as economic numbers also appear to be leveling off. I think the area will see a small softening of numbers in the next few years leading up to the 2020 census(gaining, but at a bit slower rates). The communities around Muskegon keep going back and forth between declines and gains and haven't moved much in population. Muskegon County is experiencing some growth in the more rural townships in the northern and eastern parts of the county. However 2017 estimates show an uptick in growth. Still well below the other counties in the area. The urbanized Holland area is showing modest gains, slowed per previous years. The Grand Haven area continues to grow faster than Holland, but still slower than Grand Rapids. I don't know if this growth is due to the several companies in Grand Haven attracting talent, or if it's more over flow from GR's tight housing market heading west. I work in the area and there are several housing developments with dozens of housing starts in Grand Haven Twp. and to a lesser extent in Robinson Twp. I think you're right @MJLO it's hard to find a metro under 1 million in the US that is thriving. Even in fast growing NC outside of Raleigh, Charlotte or Asheville you're not growing very fast. I know there are a ton of factors that go into population growth and decline. They can be mostly economical, but one thing a lot of the metros that are growing have in common are the fact that they are home to major Universities. At Western, a lot of my friends were from places like Flint, Jackson, Niles, Benton Harbor, Northern Michigan, etc. A lot of them came to Kalamazoo and after graduating stayed in the area. Same goes for GVSU, a lot of east siders who decide to stay in GR rather than return to metro Detroit. Cities growing are Grand Rapids, Detroit, Kalamazoo, South Bend, Ann Arbor, and Lansing. Cities declining are Battle Creek, Flint, Saginaw, Jackson, Midland, Bay City, Monroe, Benton Harbor. Just a thought. I always thought that that migration to the South and West would slowdown significantly during an extended economic boom enjoyed by the entire U.S. like we are having now. I based that on my belief that people follow job growth. But I stopped believing that because many Midwestern and Northeastern cities like Grand Rapids are having excellent job growth along with low unemployment rates - yet the migration to the Sunbelt and West continues. Now I'm trying to figure out what is keeping that trend intact. Is it simply the dislike for winter weather? There are a lot of Northeastern cities that aren't growing at all and a lot of those people are probably heading South or West. Cleveland, Upstate New York, Baltimore, Connecticut are just some examples of places that are pretty much stagnating. There's also high taxes in those regions/cities, in addition to cold weather. Well when winter lasts six months, I can confidently say that it's a big factor in the minds of many. As we become a nation of people that is increasingly becoming intolerant of anything that even slightly inconveniences us, winter has become far more unbearable. It keeps you inside, slows you down on your commute, is dangerous to drive in, is cold, leads to snow days which leads to taking PTO at work, and it goes on for 5-6 months. So you start to see people pick up and move to Florida, North Carolina, Tennessee, Texas, Arizona, etc. The difference between then and now is people are moving as a choice, not a necessity. The fact the state gained population is a minor miracle in itself considering all the factors working against it, the first on the list the 10,000 people per day nationwide who hit 65. Michigan isn't exactly #1 on their retirement destinations list. I feel like I've seen Leelanau County, Traverse City, Ann Arbor, Holland, and yes, even Grand Rapids, Michigan on national "best places to retire." lists. I think saying it's a miracle is a bit overstated. The economic factors working against Michigan started to disappear about 5 years ago. The image factors working against it lingered a bit longer than that. Historically Michigan has always had better population growth compared to it's peers during good economic times. The reversal of the affects after the worst economic conditions we've ever seen have taken a bit longer to subside, they are all but gone at this point. There are some intangibles that remain to be seen such as the states flagship city starting to be seen in a favorable light nationally. Detroit is also having billions of dollars worth of investment in it's core. That could be a game changer for Michigan as a whole. Historically the states fate has risen and fell with the fate of the auto industry alone. In the Millennial age Detroit was never seen as an attractive city compared to the trendy tech hubs. As Detroit continues to stabilize and be viewed as more hip, we should continue to see population gains compound. The unfortunate truth is that Michigan's fates and trends are almost inextricable from Detroit's. As Detroit continues its rise so should Michigan as a whole. The crappy winter factor will not be as much of a component. The publicity is nice and may have even changed a few minds but I doubt its much. A quick google of where people are retiring based on net migration for 60+ yields no surprises. I know its totally anecdotal, but I have neighbors native of FL and AZ who prefer the MI winter over the oppressive heats of their states summer. But I am sure more have moved away due to the winters then have come here and been okay with it. I agree. To everyone outside of MI, we are Detroit. I was taking an uber in CA and I mentioned Grand Rapids (I was asked, that's Detroit right?) Detroit's rise will be rising waters for all of Michigan. However, I am probably one of the few cantankerous ones that feel Michigan is already too populous and want to keep the state to myself. The crappy winter factor will not be as much of a component. Now that's a stretch. Ignoring the older segment at or near retirement, we are in an era where the younger generation has multiple career choices, is mobile, doesn't work in a cradle to grave job, values health ... fitness ... lifestyle as critical components to job selection, the winter factor will always be an important component. View it from this angle - would a person who has lived mostly in the south or west be as inclined to stick around in MI than the opposite? I'm sure some would be thrilled but my guess is it isn't 50/50. Also, it's not like our competition in the northern states is standing still. I'm encouraged by what's happening in Detroit and if becomes a raging success and translates elsewhere in the state it will serve to reduce the population bleed a bit or at best flat line it. I like the winters/falls/springs here (when we have them. I can't stand the insane heat and humidity of our ever-growing summers. Summers in the mountains in CO are some of the nicest in the world. Rockford is technically a suburb so I added the Rockford area to my numbers. 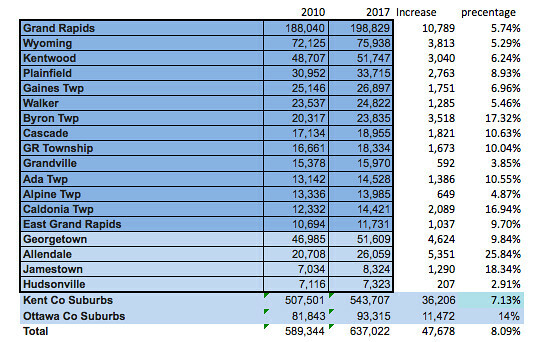 Also I included Caledonia Township, but not the village itself which adds another 1,625 residents bringing the full total to just over 680,000. The area around Rockford is gaining residents almost as fast as the western Ottawa Co suburbs. My goal over the next 15-20 years is to become a snowbird. Can't believe I'm actually getting old enough to think about that. --...I would hypothesize that most people would rather stay close to their families than chase warmer weather. OK, some have family connections in the Sun Belt, others actually do want to get away from their families for legit reasons, but most people don't. That's why I think Chicago was such a draw for my "Lost Decade" classmates - it was a bigger city that was still close enough to their families in GR. I'm sure there's data on this sort of thing somewhere. --Random thought: Michigan has a thin DoD presence, which is clearly a net loss to the state. Military bases are concentrated in the West Coast and the South, and their effect on migration has to be accounted for. Now, most service members who get out after their first enlistment go back to their home state. However, those who reenlist are soon looking to settle in the communities near where they are stationed. Before long they're raising their families there and are skilled in their ratings. After they retire from the military, local defense contractors are quick to scoop them up and give them jobs. --Bottom line, I don't think Michigan's tech sector can compete with the West Coast and the South, all things being equal. It's just too big down there. So, somebody looking to build a tech startup at all costs, or seeking the absolute best job market in that area should probably still go there. But on the positive side, anyone who actually wants to stay in Michigan but still work in tech now has opportunities to do so. You couldn't say that with much confidence fifteen years ago. Again, not based on data, just my $0.02. You're definitely onto something. There are a lot of Chicago couples getting married here, from contacts I have in that business (photography, event space, hair/makeup) and I would bet at least one person of the couple has family here already. The tech sector isn't very strong here but Grand Rapids has established itself as a jobs "cluster" region. People who are mobile are much more willing to move to a new locale if they know they aren't getting the one and only "JOB" of its kind in that sector and industry. If you're a design professional or a white collar manufacturing employee, and you move here, if you don't like the job after a year, you may very well find another one here. That's one of the benefits of being a metro over a million: job clusters. I've also noticed too that new home construction in places like Texas is less expensive than hear, historically speaking. You don't have to build basements which saves a lot of money, and they use a lot of Mexican labor which is cheaper than labor here for the most part. And Texas, Nevada, and Arizona and other Southwestern states have wide swaths of land owned by single individuals, which is much easier to put in massive developments. You can pick up 10,000 acres at a time, and then that developer can sell of phases to a bunch of national homebuilders. You're lucky if you find 30 acres in West Michigan that a landowner is willing to part with at a decent price. The downtown-centric posts here are fun to read but what would you guess, maybe 5x more happening outside the city limits? Maybe the web site should be renamed suburbanplanet.org. Not surprising. All one has to do is follow Eastbrook Homes and Allen Edwin to see where the bulk of the growth is taking place. I have even been looking at a development with Eastbrook that is down on Eastern and 100th. Suburban sprawl into farmlands and grasslands has not stopped. At least in Allendale, I think much of that growth can be attributed to the apartment and townhome boom that's occurred with GVSU's growth in the last 8 years accommodating students. Reading this article made me realize an interesting dynamic: My millennial friends that live in the Detroit area (that purchased homes) purchased them in the suburbs (Royal Oak, Ferndale, Berkeley), while all of my millennial friends that live in the Grand Rapids area (that purchased homes) purchased them in the city (Westside, Midtown, Eastown). I think I can say with a fair amount certainty that Metro Grand Rapids would not be what it is today without a strong urban core. It's not just a GR/Detroit/Michigan trend, it's a national trend. It's actually why there is a Suburban Projects thread here, to highlight that growth. But I have to say it's a lot less exciting than the stuff going on in the city, generally speaking. And generally less controversial. As Joe said a strong urban core though helps the entire region grow. If people moving here see a booming downtown, even if they plan to settle out in the burbs, they'll think "This looks like a healthy economy with a lot of things to do." Also, the GR Metro Area is small enough yet that the suburban cities truly identify with the central city. It's not like Detroit where some suburbs are an hour out from the city core and the people don't even remotely identify with it. Development in downtown GR is far more enjoyable for a suburban dweller than it would be in a much larger city.